Critical comparative perspectives are key to thinking afresh about an object of study. This is why I organised a unique event called “Religion, social action and urban policy: London and Paris face to face” that drew together academics from across disciplines and actors of civil society working on or through faith. Each panel was carefully selected to give expert reflection on the differences and similarities between France and the UK (Paris and London) in terms of managing urban ethnoreligious diversity. Given the heightened suspicion of faith in Europe today, and in particular Islam, the event focused on attitudinal change. It quickly became apparent that central to this discussion is the vexed question of French secularism (laïcité), a key aspect of assimilationist policy, and its relationship to contemporary interaction between faith communities and religious discrimination. Capturing faith and ethnicity statistics is another fundamental difference between the UK and France. French Republican ideals of neutrality and equality do not allow for such granularity in census data. Omar Khan Runneymede Trust director (London) gave a statistical overview of racial and islamophobic discrimination in employment using UK census data as a way of appealing to policy makers. By contrast, and in spite of having no data, Estelle Barthelemy, founder of Mozaïk RH (a recruitment agency of diversity in the Paris region) works with to try and increase the number of ethnically and economically disadvantaged young people in upper tier (graduate) employment. Discrimination though, is also discursive (it permeates peoples’ political speech) and paradoxically while important work has been done to limit Islamophobic and anti-Semitic (but not only) hate speech, barrister Arié Alimi and ethnographer Ben Gidley alerted us to the fine line between what at times people say and their behaviour i.e. people can work together and enjoy each other’s company yet speak in a prejudicial manner about one another. The event was funded by the PSL-University of Cambridge partnership that seeks to strengthen intellectual collaboration between the UK and France. The Woolf Institute and the Faculty of History of the University of Cambridge organised the event with the French National Scientific Research Centre (CNRS) laboratory Groupe Religions, Sociétés, Laïcités (GRSL). Read the GSRL blog post by Sami Everett and watch the conference videos here. On 17 March 2016, a conference took place in Paris at the GSRL. It was organised within the exchanges between PSL Research University and the University of Cambridge by Samuel Everett (postdoctoral researcher at the GSRL/Woolf Institute). Read the conference program. While in London civil society is often openly infused with religious values, social initiative in Paris and its periphery is structured by laïcité. This panel explores these conceptions of state secularism and questions the realities of these ‘models’ within local urban contexts as ideas of class, race and religious identity increasingly intersect. Ben Gidely [sic!] discussed three historical-social science research projects on which he has worked focusing on his historical and ethnographic work in East and North East London. He argued that national-level policy can mould how people live together and in the UK. He discussed the theory attributed to this idea: “conservative pluralism” in which the Church of England maintained overall religious supremacy by mediating for minority faiths. 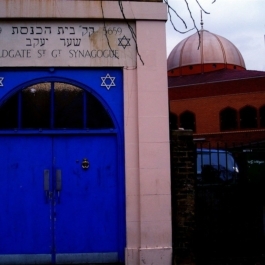 Space and place nevertheless impact on interreligious relations such as those on Brick lane which fosters neighbourhood narratives of cosmopolitanism. Finally, somewhat paradoxically, his research has shown that how people interact with one another does not necessarily concur with how they talk about each other i.e. racist speak can belie good relations.